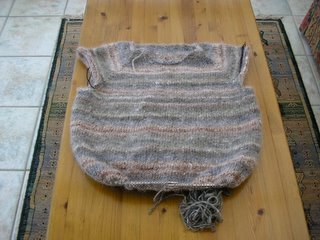 I have about another 4 inches to knit, then the body will be done. I'm hoping I'll get this done by the end of today. I've some time off this week, so I should be able to get some extra knitting in to get the sleeves done. I have just one small problem that might hinder me - as of today I don't actually have the right size needle to do the collar! The Addis are ordered, but out of stock. I'm hoping they'll arrive this week, otherwise the collar is going to be have to done with an alternative needle! I really like the yarn you're using. I hope you get the needles in time.